The old halogen pool lights cause ongoing mantainence issues as the lamps don’t last long and seals continue to fail. 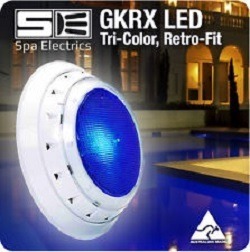 These days we have a much better option as SPA Electrics offer a retro fit led pool light that can replace most makes and models. Not only will do these lights offer lower running costs – they simply work better and provide a great atmosphere at night. The lights come in single colour or a multi colour option. They have great beam spread and operate at a fraction of the power than the existing halogens. It is important that when you change over the pool lights you use a licenced electrician as certain tests need to be performed once the light is installed and you will find that most pool shops do not have the equipement or expertise to do these tests. IF you want a quote or have a question regarding pool lighting give us a quick call.